It was a women’s night out on May 9 as the Sequoia JACL chapter honored its 2017 scholarship recipients during an evening reception at the Palo Alto Buddhist Temple’s Issei Hall. This year’s winners were Erin Hamasaki, Merrissa Hart, Mako Mori and Jordyn Sato. 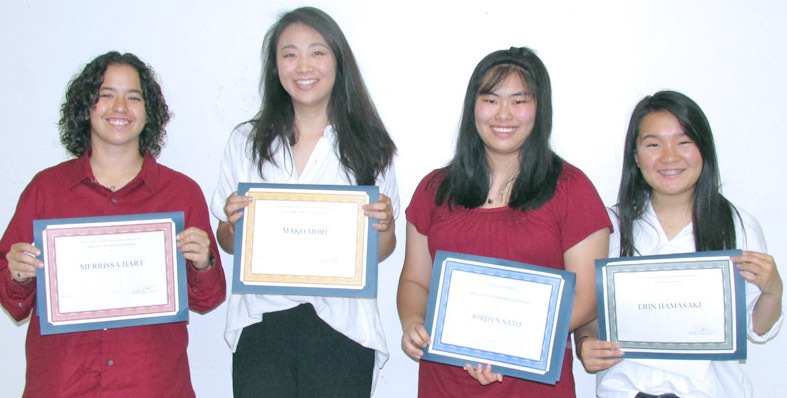 This year’s Sequoia JACL scholarship recipients are (from left) Merrissa Hart, Mako Mori, Jordyn Sato and Erin Hamasaki. Hamasaki received a $1,000 Sequoia JACL High School Scholarship. A graduate of Fremont High School in Sunnyvale, Calif., Hamasaki will attend Chapman University majoring in art with a minor in Japanese. She was a member of the National Honor Society, California Scholarship Society as well as a scholar athlete. In addition, she was active in high school sports, clubs and honors classes, as well as a member of the Mountain View Buddhist Temple YBA and Girls Scouts. Her passion for art was recognized when her artwork was displayed in the school district art show. Hart was the recipient of the $1,000 Foothill College Sequoia JACL Scholarship. Hart plans to major in psychology and specialize in art therapy to help women who are incarcerated cope with their situation and learn how to adjust back in society upon their release. After Hart’s own experience with street gangs, juvenile hall and homelessness, she took a chance of attending Foothill College, and with its support and financial resources, she excelled in her studies and activities. She now helps feed the homeless on a weekly basis at a local shelter and is an art instructor and motivational speaker. She also works as a peer adviser for the college Outreach Program, which reaches out to high school students about attending college. She will continue at Foothill College, Los Altos Hills for another year before transferring to a university. Experiences in advocacy, legislation and community organizing have shaped Mori’s goal to becoming a lawyer and protecting “the rights of those who are most vulnerable.” Mori, a student at De Anza College in Cupertino, Calif., is the recipient of the $1,000 De Anza College Sequoia JACL Scholarship. After returning from a two-year mission trip to Peru and the Dominican Republic, Mori said she wanted to help others and make a difference in the world. Her involvement in on- and off-campus activities include leading the Campus Vote Project to specifically target Asian Pacific communities to vote, managing a campaign to elect a board of trustee, member of the Public Policy School, intern for the Faculty Association Political Action Committee, member of the Political Revolution Club and Honors Program. Mori is currently continuing at De Anza College before transferring next year. Sato is the recipient of the $500 Harry & Elsie Yoshida Memorial Award, which was presented to her by Patricia Yoshida Yotsuka. The award is given to a high school student who has exhibited extensive extracurricular activities and one who gives back to the community. Sato graduated from Homestead High School in Cupertino, Calif., will attend California State Polytechnic University, Pomona, as a computer science major with a minor in accounting. Sato excelled in basketball in high school and the Santa Clara Valley Athletic League and was a student coach for the Tri-City youth basketball team. She also was extremely active in the Nakayoshi Gakko School as an assistant teacher to young children for three years. In addition, she was very active with the Mountain View Buddhist Temple and secretary for the Coast District Young Buddhist League. Members of the scholarship committee included Kerry Bahadur, Akemi Ishikawa, Tom Izu, Mike Kaku, Irene Matsumoto, Erin O’Quinn, Dave Yoshida, Patricia Yoshida Yotsuya and La Donna Yumori-Kaku.